This is not a decision I took lightly, I have been thinking about it for about a year, torn between wanting to continue and the realization that I just don't enjoy blogging anymore. I've blogged for the better part of my twenties (now I'm 31), and I'm really glad I did. I'm thankful for all my wonderful bloggy friends like Sandy, Aylee and Daisy, and the people who have been kind enough to comment over the years. Honestly, this is the thing I've stuck to for the longest time. I want to get back to writing - which got every harder the longer I blogged - and just enjoy being a fangirl and ship all the ships without having to worry about churning out content and feeling guilty because I'm not reading my review books (sorry for the books I didn't get a chance to get to, by the way). I'll still be around at @DarthClavie and in my Tumblr (which is my new obsession) where you can find me being a Girl Meets World fangirl (Lucaya Forevahhhh!!! ) and re-blogging everything the amazing Sandy-belle posts. But now Mia has a scandal of majestic proportions to contend with: Her grandmother's leaked "fake" wedding plans to the press that could cause even normally calm Michael to become a runaway groom. Worse, a scheming politico is trying to force Mia's father from the throne, all because of a royal secret that could leave Genovia without a monarch. 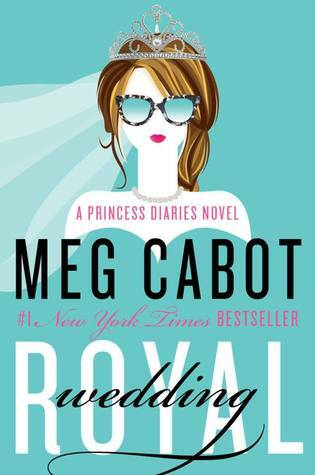 Can Mia prove to everyone— =especially herself—that she's not only ready to wed, but ready to rule as well? It's no secret that I love Meg Cabot's books, I've read them pretty much all, even the older historicals she wrote under other names. And I actually really enjoyed where Forever Princess (Princess Diaries 10) ended - it was, I think, one of the best endings to a series I've seen. So it wasn't without trepidation that I approached Royal Wedding, and I have to confess that it took me a couple of tries before I could really get into it and read it through - though that might be in part because I was stressed at work - in any case, I did finish it the other day and it was a lot of fun. First, there was something both familiar and strange in Mia's voice, she's a lot calmer than she used to be as a teen but she still has a tendency to freak out (though her freak outs don't last as long and she's a lot more assertive). Michael was adorable, and I like that they are still together and going strong even though they both acknowledge that they don't get to see each other as much as they'd like (and then they take steps to remedy that). Lily as a lawyer and Tina as a doctor totally made sense to me, I liked seeing where Mia's old pals were and that at least these two (Tina will forever be my favorite) were a big part of the story. I didn't enjoy the subplot with Boris, though, that needed resolution. Another thing, I liked seeing Mia's perspective about her sister, Olivia. I really loved that relationship - and I really recommend the companion book "From the Notebooks of a middle-school princess" because Olivia is adorable, though it is a bit of a set-up book - and how she embraced her. That's 100% Mia. All in all, I enjoyed the book, it was like meeting an old friend I hadn't spoken to in ages, it was fun to see what had changed and what hadn't. I do recommend it, specially for long time fans. I loved this book, I'll start by saying that. 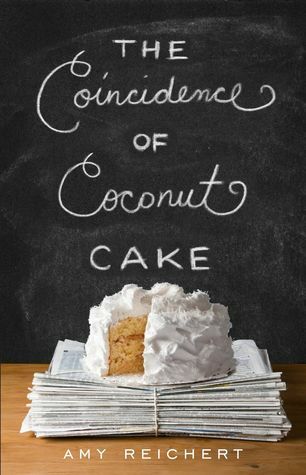 It was such a comforting read even though Lou was going through some stressful things, the Coincidence of Coconut Cake was full of warmth and sweetness and just positive things. I loved how much Lou loved her job and that she was good at it. And how she loved food in all it's many expressions - I loved all the festivals she went to with Al. This is definitely not a book to read when you are hungry or have no access to food immediately because the food it describes is amazing. I liked Al once I got to know him, he was very stand offish and a bit of a snob at the beginning, but being around Lou definitely chilled him out - while he remained essentially the same, just enjoying himself more. His friendship with the style editor - whose name just flew out of my head -was awesome. He was one of my favorite secondary characters. There is a lot of hart in the story, and I think that falls mostly in the Lou side of the equation, but she pulled it off. She is an optimist and real at the same time, and in the end she just wanted to do her own thing with her food, which I respected. I would have liked a longer conclusion - I'm big about seeing the characters happy once I stuck to them for n-number of pages - but it was a lovely conclusion anyway. I highly recommend this book, is one of the sweetest offerings of the year so far. I have been up and down with the Brothers Sinister series, I have to admit. I loved the prequel novella, but didn't enjoy the Duchess Wars, Heiress grew on me, and I really did love The Countess Conspiracy. 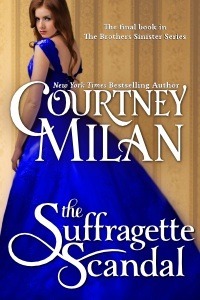 So I knew I had to read The Suffragette Scandal, if only to finish the series, sadly this one falls into the "I didn't like it/meh!" category for me. It's nothing specific really, other that I just didn't connect with Free, I wanted to, she sounded great but I just didn't have a bond with her (the way I did have a bond with Violet, and perhaps that's why I'm judging this book a little harsh). I did like the hero, Edward Clark, and I could empathize with him a lot, but he was only one half of the story and not enough to carry it all way way through in the end. But really, I think it just comes to personality types this time around, I really don't enjoy people and characters with Free's personality so this book wasn't for me, still it was well written and well researched and it has its moments of being as good as any other Courtney Milan book (which is very good!). And it was nice to catch up with older characters from previous books. Barbara Gordon is no stranger to dusting herself off when disaster strikes, so when a fire destroys everything she owns, she spots the opportunity for a new lease on life – and seizes it! Following the rest of Gotham City’s young adults to the hip border district of Burnside, Barbara sets about building an all-new Batgirl…and discovers new threats preying on her peers! As the new hero of Burnside, Batgirl gets started by facing twin sister assassins on motorcycles! Collects BATGIRL #35-40. 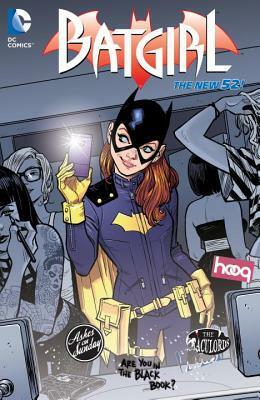 I'm a little conflicted about Batgirl of Burnside, which compiles 7 chapters of the Batgirl comic. I know it's supposed to be a bit of a reboot as part of the New 52 event and all, but I felt like I was missing something, like there was stuff I was supposed to know and I didn't. That said, I still could understand pretty well what was going on int he story, and what Barbara Gordon was doing, and how she was moving on with her life after an accident, but I felt like I had almost no clue on what people's relationships to each other were. Still the book was interesting, the artwork was cute - even if there were a few too many shots of Barbara in her underwear for me - and there were lots of things that I really liked, like her new Batgirl costume - I WANT her letter jacket - and my favorite panels were actually the ones where she was hanging out with her friends, though I admit they got a bit crowded sometimes. All in all, though, I kind of want to keep reading this story, make sense of it more as it were, because, like I said, very cute artwork and a really modern approach to the character.